DUBAI, UAE: PRNewswire: On concluding the second ‘Africa Dubai Precious Metals Forum’ in Accra, KP Chair, Ahmed Bin Sulayem met with H.E. President John Dramani Mahama to discuss Kimberley Process matters and to share the KP Chair Mid-Term Report. With Ghana being a full KP Member, the President discussed his country’s firm commitment to all KP mandates and operational criteria. Relatively small, when compared with other mining activity, the diamond industry remains relevant although it contributes less than around 5% of mineral commodities revenues to Ghana’s GDP. Mineral exports from Ghana were 2,515 Million US Dollars, in the first quarter of 2016, down a little from 2,558 Million US Dollars in the fourth quarter of 2015. The country’s best export period was the first quarter of 2012, with4,119 Million US Dollars in exports. Ghana has the 11th largest reserves of diamonds in the world and is the 14th largest producer in Africa. H.E. The President highlighted recent changes in government legislation, to Mr. Bin Sulayem, including a repatriation law where 85% of the income, derived from exporting raw materials, comes back to the country. All export transactions, diamonds included, are registered and reported by the Bank of Ghana. As a result, Ghana’sDiamonds are sought after globally, thanks to the country’s reputation of maintaining a transparent financial regulatory system and its adherence to Kimberley Process requirements. President Mahama elaborated that the system enables the government to re-invest in infrastructure and other projects. Mr. Bin Sulayem informed the President that he’d recently returned from Ghana’s second largest city, Kumasi, in the Ashanti region, where he’d witnessed the government’s policy in action, through the building of new schools. Mr. Bin Sulayem also highlighted his visit to several United Arab Emirates’ humanitarian projects, including the opening of wells and bore-holes, providing essential water supplies to entire communities. He also visited Red Crescent funded community mosques and the regeneration of several schools. H.E. President Mahama, a strong proponent of education, agreed with Mr. Bin Sulayem that education, especially in poorer communities needs continual support, and applauded the UAE charities involved in communities which are most in need. Ghana has a number of key infrastructure programmes, including the building of 200 schools, to bring affordable education to the population. The President also alluded to further proposed legislation, for incorporation into mining and trading licenses, which would compel companies to engage in environmental repatriation programmes, such as reforestation and other similar reparations. The KP Chair said his meeting with H.E. 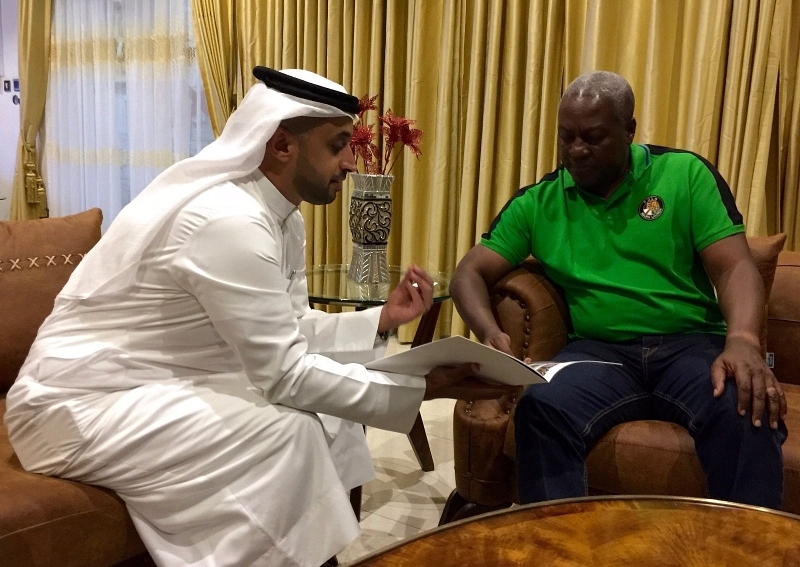 President John Dramani Mahama was informative and encouraging – and their dialogue has set the scene for more discussions about the Kimberley Process and the mining industry ofGhana. As part of his Africa Initiative, after visiting Central Africa Republic, Angola, South Africa and more recently Burkina Faso, the KP chair, Ahmed Bin Sulayem, continues to visit other African nations including DRC. The Africa initiative is a commitment by the KP Chair to keep a hands-on presence in diamond producing nations to help facilitate KP compliance, the fulfilment of KP mandates and to give Africa a voice. The Kimberley Process Certification Scheme is a collaborative initiative between governments, industry and civil society to stem the flow of conflict diamonds into the diamond trade. There are now 54 participants representing 81 countries including the UAE. In 2003, the UAE adapted its Federal Law “Union Law no.13 Regarding Supervision of Import/Export and Transit of Rough Diamonds” and became the first Arab country to implement the Kimberley Process Certification Scheme. The Kimberley Process office in DMCC is the entity authorised by the UAE Ministry of Economy to authenticate the ethical sourcing of rough diamonds traded in the country.